When the final horn sounded at Chet Anderson Stadium on Saturday afternoon, the victorious Bemidji State Beavers (1) shook hands with the visitors from the University of Minnesota, Crookston. Then equipment started flying everywhere. "It basically looks like some kind of carnage happened," said Dax Larson, assistant director of athletic media relations at Bemidji State. "There's helmets and pads all over the field." The Beavers then made a mad dash for one end of the stadium, proceeded down a small slope and, with fans cheering them on, splashed into Lake Bemidji (2) in various stages of undress and/or game dress. This was the 13th iteration of one of the greatest unknown traditions in college football: the homecoming lake dive at Bemidji State. The Dash knows all about burning spears in Tallahassee and Midnight Yell Practice in College Station and Script Ohio in Columbus. But this is a revelation, and a great one – when the Beavers win homecoming, the team takes a celebratory swim and sings the fight song. Right away. 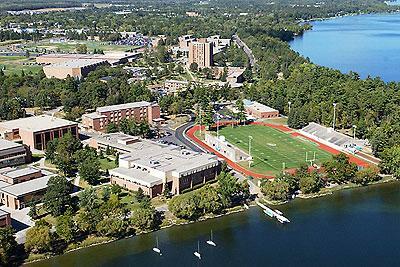 That's good use of a picturesque lake right next to campus. Like many traditions, this one was borne out of desperation. In 1993, an assistant coach of the winless Beavers wrote a fictitious account of the upcoming homecoming game that was posted around campus and included the team jumping in the lake after an upset victory. The upset never happened, nor did it occur in the next season. But in 1995, after winning just one of its previous 26 games, Bemidji State stunned defending Northern Sun Intercollegiate Conference champion Winona State on homecoming. And the team went swimming in jubilation. Under coach Jeff Tesch, Division II Bemidji State has gotten a lot better since then. The Beavers have jumped in the lake 12 of the past 17 seasons, including three in a row. "You want to have homecoming early," Tesch told The Dash, "or the water can take your breath away a little bit." The Beavers go in regardless of weather. A couple of times there have been snow flurries in the air. Mother Nature blessed them this season with an 82-degree football Saturday. School president Richard Hanson has joined the lake jump the past three years. As a one-time New York Giant in the early 1970s, he's 6-foot-6 and about 300 pounds. "He fills up the water pretty good," Tesch said. Tesch said you can usually tell the freshmen from the upperclassmen by how they approach the lake jump. "The older ones are smarter," he said. "They'll take their shoulder pads and shoes off. They know how long it takes to dry some of that stuff out." Practicing in wet cleats and shoulder pads isn't a lot of fun. But being a Bemidji State Beaver on a victorious homecoming Saturday is about as much fun as you can have in college football – and every once in a while we need the reminder that this is all a game. It's been a month to remember at Oregon State. It's been a month to be dismembered at Arkansas. And there has been a little of everything in between from coast to coast. With a five-Saturday opening month in the books, The Dash consulted with Dashette Julia Restoin Roitfeld (3) to take stock of what we've seen and where we're going. POINT OF PRIDE: An SEC team has been No. 1 in 19 of the last 24 AP Top 25 polls. DON'T MENTION: Kentucky and Arkansas are a combined 0-4 against the Sun Belt and Big East. BEST TEAM: Alabama (4). And no, it's really not close. When Mississippi scored a touchdown in the second quarter in Tuscaloosa on Saturday night, it marked the first time the Crimson Tide had trailed all season. The one-point deficit lasted 15 seconds. Christian Jones returned the ensuing kickoff 99 yards for a score and order was restored. Alabama has outscored five opponents 62-0 in the first quarter. The only worry for the Tide at this stage is skill-position injuries; running back Dee Hart and receiver DeAndrew White suffered season-ending knee injuries against Mississippi, joining running back Jalston Fowler (knee) on the shelf. BIGGEST BUST: Arkansas (5). This isn't close, either. After giving up an inconceivable 716 yards at Texas A&M on Saturday, you have to wonder whether the Razorbacks have given up. They've lost four straight and been outscored 110-10 in two SEC games. And the scary thing is, there are six league games left, three against ranked opponents. Hard as it is to imagine, this could actually get worse. DON'T SLEEP ON: Mississippi State (6). The 4-0 Bulldogs haven't played a great schedule yet, but their emphatic victory over Auburn looks better as time goes on. LSU certainly had a much greater struggle with Auburn than Mississippi State did. MSU leads the nation in turnover margin (plus-13) and could thrive in that area again this Saturday facing a pair of freshman quarterbacks at Kentucky. Then come home dates with Tennessee and Middle Tennessee. Not out of the question that the Bulldogs could be 7-0 visiting Alabama Oct. 27. PSYCHO TEAM: Tennessee (7). This is a team of wild mood swings – during games. The Volunteers gave up 27 points to Georgia in the first 18 minutes and 12 seconds, then outscored the Bulldogs 20-0 over the next 11:06. Then the Vols gave up 21 more in the first nine minutes of the third quarter. They had a 20-13 lead at home on Florida, then surrendered the final 24 points of the game. They gave up 23 first-half points to Akron. Momentum is a fickle thing for Derek Dooley's team. 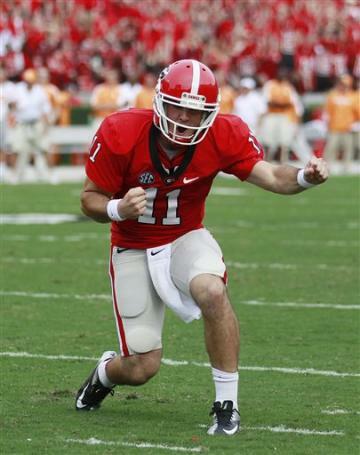 BEST HEISMAN CANDIDATE: Aaron Murray (8). The Georgia quarterback is third in the nation in pass efficiency. If he excels in huge October games against South Carolina and Florida, and the Bulldogs win, he'll jump into the mix. Problem is, the Bulldogs' freshmen running backs Todd Gurley and Keith Marshall are stealing headlines from Murray with their play. It's a good problem for Mark Richt to have. BEST OCTOBER STORYLINE: How the East will be won. Leading contenders Georgia, South Carolina and Florida all play each other between Oct. 6-27. By the time the calendar flips to November, we'll have a very good idea who will represent the East in the SEC title game. COACH MOST LIKELY TO LET HIS TEAM JUMP IN A LAKE: Les Miles. Mad Hatter will be upset that he didn't think of it first. COACH LEAST LIKELY TO LET HIS TEAM JUMP IN A LAKE: Nick Saban. Are you kidding? POINT OF PRIDE: Eighty percent of the conference heads into October with a winning record, and half is undefeated. DON'T MENTION: The weak non-conference September schedule played by virtually everyone in the league. BEST TEAM: Kansas State (9). In keeping with the personality of their 72-year-old coach, the Wildcats are determinedly dull. They run the ball. They stop the run. They do not rank in the top 40 in either total offense or total defense. They have four offensive plays longer than 40 yards this season – none of them since Sept. 8. They just churn out victories. BIGGEST BUST: Oklahoma (10). Bob Stoops' program has lost its dominance in the trenches in recent years, and it's been especially obvious this season. In the only two Sooners games that matter, they were outrushed – by a little against UTEP, by a ton against Kansas State. In between was a meaningless stat padding against Florida A&M. The season is far from a bust at this point, but Oklahoma forfeited its margin for error by losing its first Big 12 game. DON'T SLEEP ON: Texas Tech (11). No, the Red Raiders don't have a landmark victory yet, but beating Iowa State isn't automatic anymore – just ask Oklahoma State, Nebraska and Texas. Tommy Tuberville has drastically improved the Tech defense, which leads the nation in fewest yards allowed. Tech has only surrendered one play from scrimmage longer than 30 yards in its first four games. PSYCHO TEAM: Oklahoma State (12). This was supposed to be one of the best defenses in Mike Gundy's eight years in Stillwater, but after the charade shutout of Savannah State to open the season, it is giving up 41.3 points per game. Being trampled at Arizona was a major early-season surprise. BEST HEISMAN CANDIDATE: Geno Smith (13). 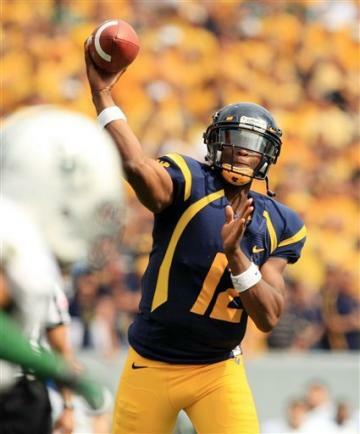 The West Virginia quarterback is the best Heisman candidate in any league. He has 20 touchdowns and 28 incompletions on the year, and his current passer rating of 208.4 would obliterate the NCAA season record. BEST OCTOBER STORYLINE: Can West Virginia keep it up? The Mountaineers play three straight October games against currently unbeaten teams: at Texas, at Texas Tech and home against Kansas State. Given the defense, outscoring the opposition seems to be the only alternative. That will get tougher to do as the season wears on. COACH MOST LIKELY TO LET HIS TEAM JUMP IN A LAKE: Dana Holgorsen. With Guns 'N' Roses hired to play on the beach. COACH LEAST LIKELY TO LET HIS TEAM JUMP IN A LAKE: Bill Snyder. Believed to be allergic to frivolity. POINT OF PRIDE: Oregon State, UCLA and Arizona have improved, enhancing the league's depth. DON'T MENTION: California or Colorado, a combined 2-8 with several bad losses. Washington State hasn't experienced an immediate renaissance under Mike Leach, either. BEST TEAM: Oregon (14). The Ducks scuffled for a while Saturday at Washington State in their first trip outside the Eugene cocoon. But if a 25-point road win in a conference game is all there is to worry about, then the program is in phenomenal shape. BIGGEST BUST: USC (15). What has happened to the Trojans' offense? They were shut out in the second half at Stanford, then led just 17-9 going into the fourth quarter against Cal. Matt Barkley has gone from Heisman front-runner to Just A Guy at quarterback, ranking 48th nationally in efficiency. DON'T SLEEP ON: Oregon State (16). The Beavers have impressed in every game, from shutting down Wisconsin to jumping on UCLA in Pasadena to outscoring Arizona in Tucson. Promising sophomore quarterback Sean Mannion has escalated his production every game, and now gets to feast upon the vulnerable pass defense of Washington State. PSYCHO TEAM: Washington (17). The Huskies have allowed a total of 38 points in three home victories. They allowed 41 on the road in a rout at LSU. Next up: a trip to Oregon. Time to step it up away from home or this will be ugly, too. BEST HEISMAN CANDIDATE: Johnathan Franklin (18). The UCLA running back has cooled off a bit after starting the season with consecutive 200-yard games, but he's still fourth nationally in rushing and averaging a whopping 7.5 yards per carry. Franklin is the leading man thanks to the job share in the Oregon backfield between DeAnthony Thomas and Kenjon Barner and the surprising mediocrity of Barkley. BEST OCTOBER STORYLINE: In a year when Mike Leach and Rich Rodriguez entered the league, is the Pac-12 actually turning to defense? Seven teams rank in the national top 40 in scoring defense, while just four are in the top 40 in scoring offense. Five teams are averaging less than half as many points in conference games as they are in non-conference: USC (45.5 out of conference, 20.5 in); Stanford (35 and 17); California (34 and 13); Arizona (46.3 and 17.5); and Utah (28.3 and 7). COACH MOST LIKELY TO LET HIS TEAM JUMP IN A LAKE: Chip Kelly. Phil Knight will build him a lake right outside Autzen Stadium if he asks and Ducks just take to water. COACH LEAST LIKELY TO LET HIS TEAM JUMP IN A LAKE: Mike Leach. Prefers sending his guys to equipment sheds. POINT OF PRIDE: Florida State is back as a national title contender. DON'T MENTION: Big East 4, ACC 1 head-to-head. BEST TEAM: Florida State (19). Sluggish victory at South Florida was expected – letdown game and first road trip of the season. With that out of the way, the Seminoles can go back to beating up on the ACC the next two weeks – North Carolina State and Boston College – before the schedule gets interesting again. BIGGEST BUST: Virginia Tech (20). BeamerBall has rarely been highlighted by explosive offense, but this is worse than usual. The Hokies do not rank in the top half of the nation in rushing offense, passing offense, total offense or scoring offense. And they gave up 62 points in two upset losses to Big East opponents. DON'T SLEEP ON: Duke (21). The biggest testament to program futility was the Blue Devils' 12-game losing streak to Wake Forest. That ended Saturday, as Duke improved to 4-1 with the only loss at Stanford. The schedule is difficult the rest of the way, but David Cutcliffe's team has a shot at the program's first bowl since 1994. PSYCHO TEAM: Georgia Tech (22). No team is more nuts than the Yellow Jackets. They gave away the season opener to Virginia Tech. They destroyed Virginia 56-20 just 12 days later. They went from 19 down to 17 up to blowing the game late against Miami. And then they were inexplicably routed at home by Middle Tennessee State on Saturday. Their late-game defense has been abysmal. BEST HEISMAN CANDIDATE: E.J. Manuel (23). The Florida State quarterback was nowhere near as spectacular against South Florida as he was the previous week against Clemson, but he didn't have to be. There will be other big games to come in which he'll probably have to play like a superstar. If he does and the Seminoles win, he'll stay prominently placed in the national picture. BEST OCTOBER STORYLINE: The Florida State-Miami rivalry, expected to carry the ACC when the league pirated the Hurricanes away from the Big East seven years ago, may finally be what it was billed to be. The two traditional powers lead their divisions, are a combined 9-1 and could both be ranked at kickoff for just the second time in the last six years. They play in Miami Oct. 20. COACH MOST LIKELY TO LET HIS TEAM JUMP IN A LAKE: Jimbo Fisher, Florida State. Hunting dogs have no problem going in the water to get their prey. Show dogs wouldn't go there. COACH LEAST LIKELY TO LET HIS TEAM JUMP IN A LAKE: Randy Edsall, Maryland. Sounds like the lax, lack-of-discipline kind of thing Ralph Friedgen would let his team do. POINT OF PRIDE: Basketball season starts soon. And basketball will be good. BEST TEAM: Ohio State may be the best team, Northwestern may be the last unbeaten bowl-eligible team, but Nebraska (24) is the best bowl-eligible team. The hiccup at UCLA hurt, but the Cornhuskers are positioned to win the Legends Division if they can keep Taylor Martinez and Rex Burkhead healthy. But make no mistake, this is not a great team. BIGGEST BUST: Michigan (25). The most impressive thing the Wolverines have done in 2012 is turn the ball over six times at Notre Dame and only lose by a touchdown. And that's not very impressive. From Denard Robinson's struggles to the softness of the defensive line, nothing has gone well in Ann Arbor. DON'T SLEEP ON: Penn State (26). After the off-season from hell and an 0-2 start, the Nittany Lions have regrouped and gotten better every week. Quarterback Matt McGloin has taken a lot of grief from fans during his career, but he's persevered and has at least avoided negative plays – he's thrown just two interceptions in 170 attempts and doesn't take many sacks. Northwestern's visit Saturday looms unexpectedly large. PSYCHO TEAM: Wisconsin (27). It's almost as if the Badgers have forgotten who they are. They can't run, they can't protect the quarterback, they can't hold a 17-point second-half lead against Nebraska. The October schedule sets up for a chance to rebound from a 3-2 start, but it's hard to predict what this team will do. BEST HEISMAN CANDIDATE: Braxton Miller (28). The Ohio State quarterback seems to be growing into Urban Meyer's offense. The numbers have been consistent – he's produced at least 296 yards total offense every week – but the quality of play has improved. Instead of needing a coverage bust to hit a wide-open receiver, Miller threaded a beautiful throw to Devin Smith for what proved to be the winning touchdown against Michigan State on Saturday. Definite sign of progress. BEST OCTOBER STORYLINE: Can Ohio State stay unbeaten without being good at anything? The Buckeyes do not lead the Big Ten in a single team statistical category. They don't even rank second in anything. They are solid running the ball and stopping the run, but unspectacular in any area. The October schedule is interesting (Nebraska, at Indiana, Purdue and at Penn State), and November now looks softer than it did a month ago (Illinois, at Wisconsin, Michigan). Could Meyer go 12-0 in Year One with a team that couldn't even stay on the field with his Tebow-Era Florida squads? COACH MOST LIKELY TO LET HIS TEAM JUMP IN A LAKE: Jerry Kill. Has the most lakes to choose from. COACH LEAST LIKELY TO EVER LET HIS TEAM JUMP IN A LAKE: Mark Dantonio. Humorless. POINT OF PRIDE: Big East 4, ACC 3 head-to-head. DON'T MENTION: The losses to Youngstown State (Pittsburgh), Ball State (South Florida) and Western Michigan (Connecticut). BEST TEAM: Cincinnati (29). 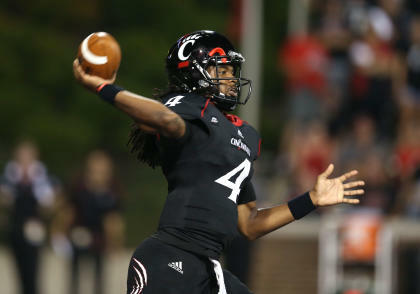 The Bearcats have only played three games, but the results have been good so far. They were the better team Saturday while beating Virginia Tech in Landover, Md., despite having to rally for the winning score in the final seconds. They blew out Pittsburgh in their opener, a victory that The Dash believes will only look better as the season progresses. As dual-threat quarterback Munchie Legaux geauxs, so geaux the Bearcats. BIGGEST BUST: South Florida (30). A team considered the preseason league favorite in some quarters is a last-minute touchdown against Nevada away from being 1-4 and on a four-game losing streak. As it is, a three-game losing streak that includes a loss to Ball State is pretty bad. The Bulls have won just three of their last 13 games. DON'T SLEEP ON: Pittsburgh (31). The Panthers were horrendous to start the season, losing to Youngstown State and badly to Cincinnati. They were also a minus-4 turnover margin in those games. In the two games since – emphatic wins over Virginia Tech and Gardner-Webb – they're a plus-5. If Pitt holds onto the ball it should have a chance to win every remaining game. PSYCHO TEAM: Connecticut (32). Pitt has been plenty psycho, but the 3-2 Huskies are the most inconsistent. They've neither won nor lost two in a row. They've lost at home and won on the road. They lost by three to an ACC team (North Carolina State), then won by three against an ACC team (Maryland). They lost by six to a MAC team (Western Michigan), then won by seven against a MAC team (Buffalo). Nobody knows what's next. BEST HEISMAN CANDIDATE: Teddy Bridgewater (33). Don't be fooled by the Louisville quarterback's pedestrian numbers at Southern Mississippi on Saturday (9 of 13 for 85 yards, one touchdown and one interception). That game was played in a monsoon that made passing so difficult, the Golden Eagles attempted only nine passes and completed just two. Bridgewater still is completing 73 percent of his passes and ranks 24th nationally in efficiency. BEST OCTOBER STORYLINE: Can the league coax two unbeaten teams into November? Rutgers has a great chance to be 8-0, with three manageable home games (UConn, Syracuse and Kent State) plus a trip to Temple. Louisville and Cincinnati could meet on Friday, Oct. 26, with one or both undefeated. There could at least be something more than basketball to watch in the Big East a month from now. COACH MOST LIKELY TO LET HIS TEAM JUMP IN A LAKE: Kyle Flood. Young and undefeated. Life seems easy right now. Why not? 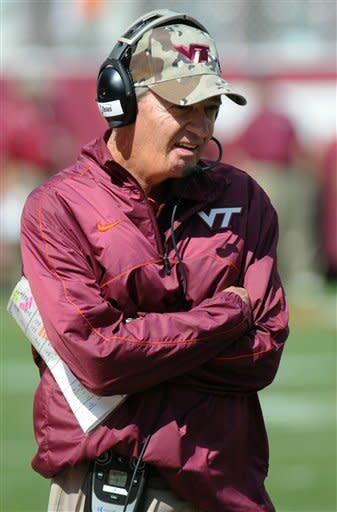 COACH LEAST LIKELY TO LET HIS TEAM JUMP IN A LAKE: Paul Pasqualoni. At his age you have to be concerned about pneumonia. Notre Dame (34). This is a huge month for the undefeated Fighting Irish. They face Miami in Chicago on Saturday. Then Stanford and BYU in South Bend the next two weekends. Then at Oklahoma on Oct. 27. Get through that undefeated, and everyone circles the USC game Nov. 24. 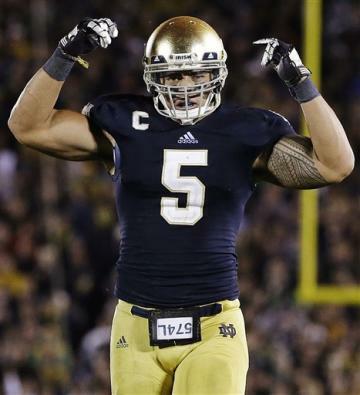 But that won't be feasible unless Brian Kelly gets more out of the No. 95 offense in America. Defense and turnover margin are nice, but sooner or later you must be able to score and move the ball against quality opponents. Louisiana Tech (35). Undefeated Tech plays Texas A&M on Oct. 13 in a game rescheduled by Hurricane Isaac. The Bulldogs haven't scored fewer than 44 points in a game this season. The Aggies are averaging more than 48 points per game. That will be a fun one, and if Tech wins, it should be 10-0 going into closing games against Utah State and San Jose State. That would give the disintegrating WAC one last storyline to rejoice in. Ohio (36). 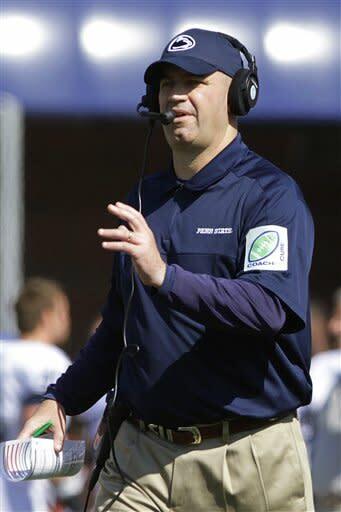 The 5-0 Bobcats played like they were starting to believe their own modest hype Saturday, needing a fourth-quarter rally to beat winless Massachusetts. They only play one team the rest of the regular season who ranks in the Sagarin Top 100 (No. 90 Ball State). If they want to be taken seriously, Ohio needs Penn State to keep winning and validate the season-opening triumph in Happy Valley. It's a banner year for books on Army football. The Dash mentioned the book by Joe Drape of The New York Times earlier this season, and now comes, "When Saturday Mattered Most," by Friend of The Dash, Mark Beech of Sports Illustrated. Beech, a West Point graduate himself, focuses on Army's last hurrah as a national power in the late 1950s. He specifically zeroes in on the final season under legendary coach Red Blaik, an 8-0-1 overachievement in 1958 that featured The Lonely End formation and a Heisman Trophy for running back Pete Dawkins. (That was just the beginning of an accomplished life for Dawkins, who went on to become a Rhodes Scholar, Brigadier General and vice president of Citigroup). If you want to learn about a bygone era at a place that suits up some of America's best and brightest and bravest, The Dash recommends Beech's book. Doc Holliday (37), Marshall. Mostly, Holliday earned his medical insurance. If you didn't see it, Holliday got excited after one of his players blocked a Purdue punt. In the process of watching him return it for a touchdown, Holliday collided with an official and came away with a Chuck Wepner-sized gash on his cheek. He coached the rest of the game with blood on his face and neck, with a 51-41 loss adding insult to injury. But you've got to play (and coach) hurt in this game, and Holliday did that. Stay chill on the sideline this week against Tulsa, Doc. 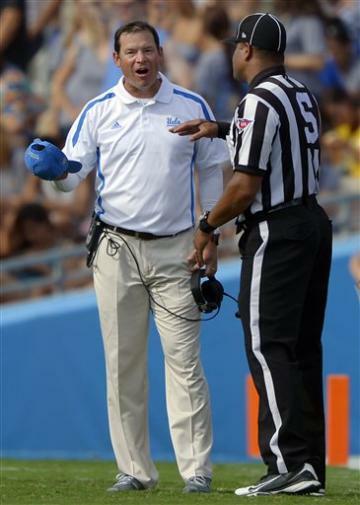 Jim Mora (38), UCLA. Not to be outdone by the churl across town, Mora went on his own media crackdown last week. He threw the media out of practice one day, publicly and profanely berating a UCLA media relations worker who was also tossed from practice. The tensions were obviously high given the Bruins' opponent, Colorado (1-3). No way they could risk the humiliation visited upon Washington State the previous week by losing to the Buffaloes. Lighten up, Jim. The media won't win or lose any games for you. … Steve Atwater (39), former hard-hitting Arkansas safety. If anyone has any information on the whereabouts of the Super Bowl winner with the Denver Broncos, please apprise The Dash. Meanwhile, The Dash is pleased to report that last weeks' APB subject, former Appalachian State defensive back Corey Lynch, is alive and well and still playing in the NFL. Lynch, who blocked the field goal that preserved what may be the biggest upset in college football history over Michigan, is with the San Diego Chargers and has recorded three tackles on the season. When thirsty and looking for a spot to watch wall-to-wall football in Nashville, The Dash recommends Jed's Sports Bar and Grille (40) near the Vanderbilt campus. There is a patio with TVs. There is a bar with TVs. There is a second floor with TVs. And there is a third floor with TVs. And there is beer aplenty as well. Have a locally brewed Yazoo Pale Ale and thank The Dash later.